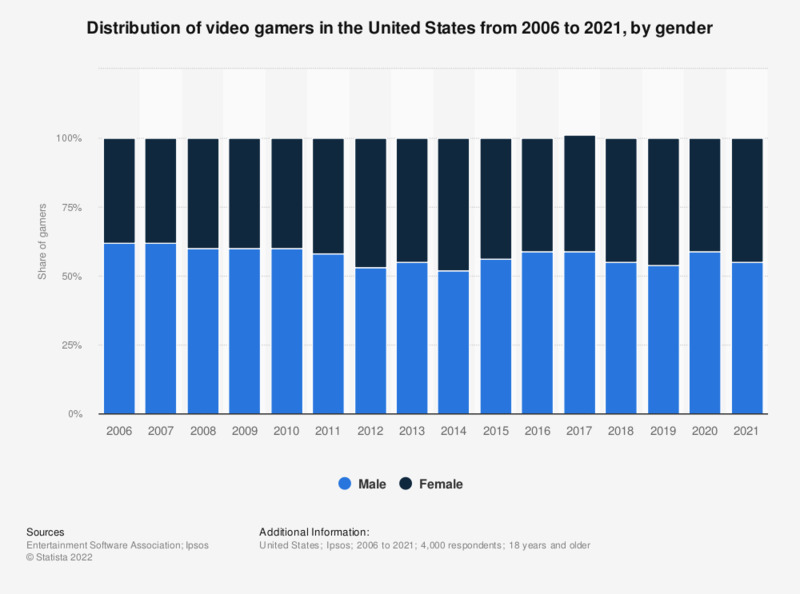 The statistic shows the gender split among U.S. computer and video gamers from 2006 to 2018. In 2018, it was calculated that women accounted for nearly 45 percent of all gamers in the United States, a slight increase over the previous year. The global gaming industry has been developing at a fast pace in recent years. Based on a 2015 forecast, worldwide video game sales have amounted to nearly 75 billion U.S. dollars in 2015 and are expected to grow to 90 billion by 2020. In 2014, it was calculated that there were some 1.8 billion gamers in the world, which equals to about 25 percent of the entire global population. Video gaming is therefore, not a mere pastime of children or a passing fancy. It is the basis of a tremendous industry, worth over tens of billions U.S. dollars. Although the largest regional market in terms of sales as well as number of gamers is Asia Pacific, the United States is also an important player within the global video games industry. In fact, many consider the United States as the birthplace of gaming as we know it today, fueled by the arcade game fever in the ’60s and the introduction of the first personal computers and home gaming consoles in the ‘70s. Furthermore, the children of those eras are the game developers and game players, the ones who have driven the movement for better software solutions, better graphics, better sound and more advanced interaction not only for video games, but also for computers and communication technologies as we know today. Today, 27 percent of U.S. video gamers are between the ages of 18 and 35, so roughly every third game enthusiast is a Millennial, with figures skewing more and more towards the younger generation with recent years. However, 26 percent of surveyed Americans who admitted to playing video games were at least 50 years old. Those who play console games, do so for an average of 29 hours per month as per calculations from the second quarter of 2016. Regardless of age or gender, U.S. video gamers seem mostly interested in action and shooter games, as those were the two most popular video game genres in 2016 based on share of sales. The 2018 figure calculated based on provided distribution data. Figures exceed 100 percent most probably due to rounding. PlayStation Plus* of October: which game did you appreciate the most?